? This garlic processing line consists of elevator (to deliver whole garlic to the garlic clove separator), garlic clove separator, picking line for separated garlic cloves, elevator (to send separated garlic cloves to the garlic peeling machine), garlic peeling machine, picking line for finally peeled garlic cloves, etc.
? The line also can be equipped with bubble cleaning machine, dewatering machine, garlic slicing machine, garlic paste making machine, garlic slice fryer machine, and garlic drying machine, packing machine, etc. 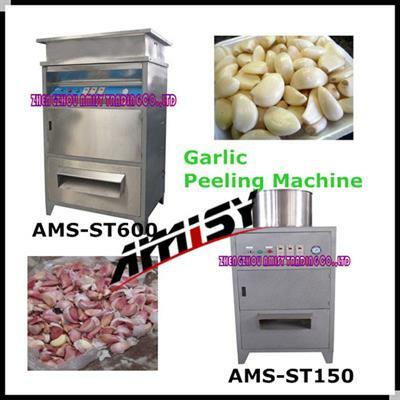 other equipment as per different production requirements, for garlic deep processing. This garlic separating peeling line is consisted of two sets of elevators, garlic separator, picking line for separated garlic cloves, garlic peeling machine, picking line for finally peeled garlic cloves, and other required garlic deep management equipment.